20th - 26th Oct: Are you ready for your next adventure? Join us for the adventure of a lifetime! 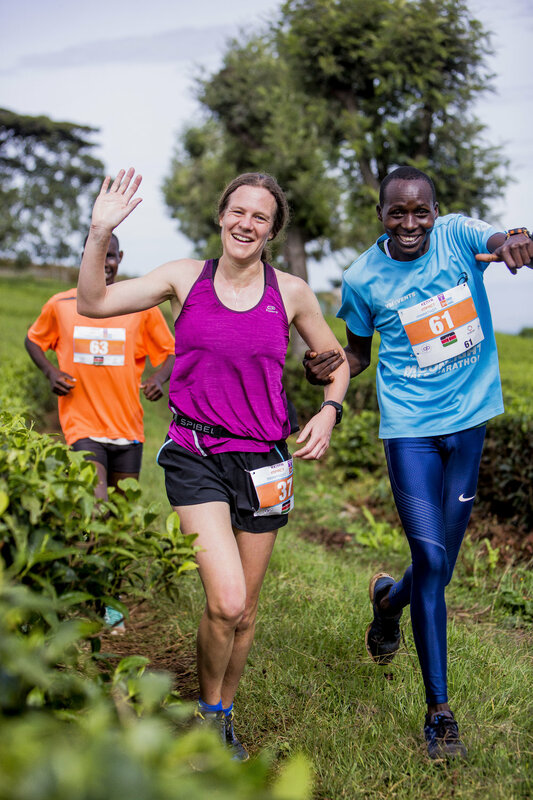 In October 2019, we're taking a team of 50 runners out to Kericho, a tea growing region situated in the west of Kenya. Whether you're a casual jogger, an aspiring marathon participant, or a seasoned runner looking for a challenge, we've got a distance that will suit you. But what makes this race different to most? Because you'll be raising money for the very communities through which you'll be running. You'll have the opportunity to meet some of the entrepreneurs that Five Talents works with, and to see exactly how your race will have an impact. Want to hear about last years’ race? Click below to visit our blog and read all about it from one our participants! Prefer a slower pace? Why not click here and join the team of trekkers instead! We've got 10k, half, and full marathons on offer in Kericho. Join with hundreds of Kenyans as we run a stunning route through the cool highlands in the centre of the country. Click here for more race details. You'll visit, meet and run with the very people whose lives you are impacting. Five Talents works with 22,000 entrepreneurs across East Africa, providing them with the basic financial services like a safe place to save that allow them to start small businesses. Click here to read about the impact you'll have. This is more than just a race, this is the Kenya Impact Marathon! It's not just about the race day, over the week you'll spend time with your fellow runners, explore the beautiful area around Kericho, and have the option of adding on a safari or visiting other projects. Click for more details about the experience of a life-time. Five Talents Impact Marathon - In Oct 2018, we'll be taking 50 runners out to Iringa, a town that sits in the beautiful highland setting of central Tanzania for a race like no other. Join us in October 2019 for a race of a life time: challenge yourself and have a long-term positive impact on the communities you run through. Take part in a timed 26.2 mile route off the tourist track through stunning scenery, gentle hills, and the villages where Five Talents UK works. If you're bored of the average city marathon, this is the race for you. If a full marathon isn't your style, we also offer half marathon and 10 kilometre options. Whichever option you choose, whether you run or walk, you'll be part of a diverse group of people from the UK, Kenya, and the rest of the world. During your week in Kenya you will have an opportunity to visit two of our microfinance programmes and see for yourself how it changes lives. Witness exactly where your fundraising is having an impact. You'll have time to eat, dance and enjoy life Kenyan style, sharing stories and making connections with a great group of people. It's a genuinely unique experience organised by a professional team from Impact Marathon Series, a logistics company with a strong track record of organising races like this. You can sneak a peak at the race course, or check out our FAQs for other details. Meet a few of our runners! 2018 Kenya Impact Marathon and Tea Trek! Five Talents Impact Marathon - In Oct 2017, we'll be taking 50 runners out to Kericho, a town that sits in the beautiful setting of central Kenya for a race like no other. Visit the Five Talents financial inclusion programme in Kenya and see for yourself how it changes lives - meeting some of the 14,500 beneficiaries who access our savings, loans and business skills training every day. View the video below to find out about Five Talents UK's work in East Africa and how it impacts the communities you'll be running through. You can also read more about our model, impact, and clients on our main site. We ask that each runner raises a suggested minimum of £1000, every pound of which will support our programmes, impacting the lives of communities like the ones you'll be visiting on your trip with us. Over the course of the year we will provide our runners with fundraising tips and share stories from last year's marathon to inspire you in your fundraising. For runners who opt for shorter distances, we are happy to relax our suggested fundraising total a little, though every little helps! For more details, visit our FAQs or feel free to contact us. Robert is just 25 years old, but he has plenty of bright ideas. Originally, Robert was working as a labourer and road worker. He was trying to save his money to pay for university fees, where he was completing a Master’s degree in Business Studies. As a labourer he helped build a local kindergarten created from a Five Talents loan by another one of our members! He joined our savings and loans group and became the Treasurer. He was proud to be a leader among the group and fancied himself a disciplinarian, boldly charging fines to members who were not attending meetings! After completing his degree Robert took out a loan through the group to start a business, a small shop where he sells milk, nuts, crisps, sodas, and other products. He has added M-Pesa to as well for added income. Our 2018 Marathon runners and trekkers went to visit him in October and he was well stocked and ready to see us! When our team visited him he had already returned his loan, and was considering taking out another! Sunday: Arrival in Nairobi where you will stay overnight and get to know your fellow runners. Monday: We’ll be heading to the Mathare Slum in Nairobi where you can see the immense need in Kenya. Tuesday: Time for a run! We have an adventurous day getting acclimated to our new altitude. Afterward we will visit a Five Talents project near Lake Naivasha. Wednesday: Join (or just watch!) elite Kenyan runners and coaches at a track session, and soak up the atmosphere wandering home through the market. Thursday: You’re in for an inspiring day visiting a Five Talents' programme. In the afternoon, there will be a Q&A session with local Kenyan runners so that you can find out everything you've always wanted to know about running as an elite. Saturday: Departure day back to Nairobi or why not extend your trip of a lifetime and make the most of East Africa's beauty - head on safari in world famous Masai Mara, or go relax on the beach! If you are interested in add ons email info@impactmarathonseries.com for more information. We've got lots of answers on our FAQs but if you can't find what you're looking for, please do contact us. You'll be in shared accommodation in two person rooms (single supplement will be available at an extra cost - email info@impactmarathonseries.com for more information on this! ), en-suite rooms with WiFi, a friendly communal cafe area, and plenty of space within the grounds. You get a lot of bang for your buck and enough Kenyan quirkiness to keep you entertained! The price of this trip is £895. Anyone who registers in the first week will receive a free Nairobi Adventure safari! Our travel package includes accommodation, most of your meals and all transport in-country including airport transfers to/from Nairobi and to project visit sites. An initial deposit of £195 is required on registration. We do ask you delay on booking flights until Five Talents and IMS give the go-ahead! Runners wait at the start line for the 2018 race to begin! You'll find answers to many of your questions in our FAQs.